Thank You to Box Hill Institute Interior Design! This week we are at the Furnitex Expo. So far it has been a great success with heaps of interest in the eco-friendly nature of our furniture. 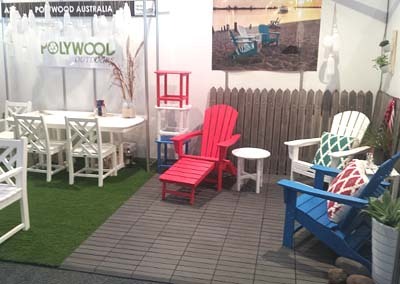 We can't thank enough the Box Hill Institute Interior Design class for helping us design our expo stand. We ran a competition with the class to come up with an expo design which would suit the environmentally friendly aspect of the products, while displaying the range in an attractive way. There was so many great designs that it was hard to choose. But in the end the winning students were Megan Medwell and Linda Rubens-Jumelet as we thought their design best suited the beachy and Hamptons style of the products, while highlighting the environmental features (through the cutest lanterns and plant pots made from milk bottles).